The diagram illustrates the hydrological cycle by which water moves through our natural environment. Overall, there are several stages to the process involving evaporation, precipitation and the final return of water to the ocean where the process begins over. Since 80% of all water begins in the ocean, most water originates from this source. Initially sea water is warmed by the sun, causing it to evaporate into the air becoming water vapor. This then rises to condense into clouds at a higher elevation, which are then then pushed by the wind over land where it condenses further and precipitation occurs, falling as either snow or rain. After precipitation on land, water then takes one of three routes. Some of it may fall into lakes or return to the ocean as surface runoff. Still further water percolates underground to an impermeable layer where it again flows back to the sea. Salt water also intrudes from the ocean into the land in coastal areas. Give a background sentence from the diagram that sets up the process to begin. A diagram may be thought of as a cause and effect process. In this case we can show the effect of evaporation, the cause of the cloud formation and so on. We should explain to the reader enough for them to understand what they are reading. It’s not enough to just state the mechanics of each stage without explaining why the cause and effect of each happens. Use sequence words where necessary to show the process progression to completion. There are three routes which water can take when it falls as rain. This is your topic sentence which enables the writer to give each route as a separate supporting sentence after that. We should try to mention all key areas of the diagram, and the final “salt water intrusion” stage should be mention. Remember to use a variety of word forms in your answers, for example, intrusion (intrude), percolation (percolate). 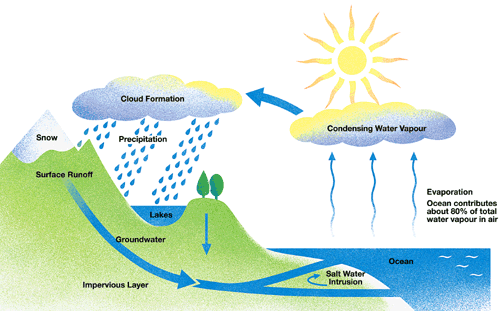 The diagram illustrate the hydrological cycle which water move through our natural environment. Overall there are several stage to the process involving evaporation, precipitation and the final return of water to ocean where process begins over. Since 80% of all water begin in the ocean, most water origination from this source. Initially sea water warmed by the sun, causing it to evaporation into the air becoming water vapor. This then rise to condensing into clouds at higher elevation, which are then then pushed by the wind over land where it condenses further and precipitation occurs, falling as either as snow as or rain. After precipitation on land, water then take one of three routes. Some of it may fall into lake or return to the ocean as surface runoff. Still further water percolate underground to an impermeable layer where it again flow back to the sea. Salt water also intrusion from ocean into land in coastal areas. Since 80% of all water begins in the ocean, most water originates from this source. Initially sea water is warmed by the sun, causing it to evaporate into the air becoming water vapor. This then rises to condense into clouds at a higher elevation, which are then then pushed by the wind over land where it condenses further and precipitation occurs, falling as either as snow or rain. “originate” is a verb while “origination” is a noun. “evaporate” is a verb while “evaporation” is a noun. “intrude” is a verb while “intrusion” is a noun.